SSD | SHISHIDO ELECTROSTATIC, LTD.
"ESD&Cleanroom Dust Contamination Control 2019 "
As for the measures for the electrostatic trouble(ESD), leave it to SSD of the expert. 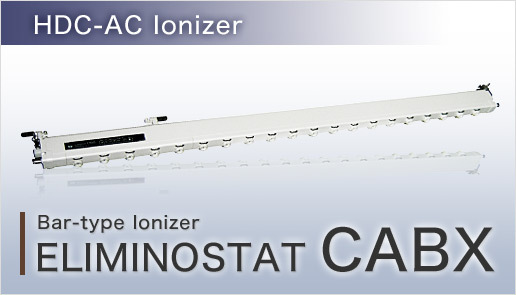 Expertise of Manufacturer of IONIZER is necessary for the removal of static electricity. Development centered on interactive and capacitive coupling static elimination equipment. The unique AC-type high-voltage power supply (patent pending) developed by our company is compact and maintains a stable electrical supply. The HDC-AC mounted ionizer is equipped with superior features such as the ability to maintain long-term stability in static elimination. Shishido Electrostatic(SSD)’s ionizer can be used safely and effectively with any electronic products for static elimination. Uniform and effective static elimination of the entire area of a liquid crystal panel can be done when it is transported. Balanced static elimination can be done on the entire area of a wafer when it is inserted into a wafer cassette. Static elimination of sudden electric charges can be done when a wafer is removed from the stage. When handling an IC in a tray, it is possible to maintain low voltage in the IC at any time. When handling the display and base of a cellular phone, it is possible to work under low voltage control at any time. When inspecting display modules, it is possible to work with the whole surface of the module in a neutral state at any time. Pinpoint ionizing of precision parts that are being fed by a parts feeder or similar device.